Golden Crest Marketing Network Pvt. Ltd. is a professionally managed organization recognized as one of the prominent Electrical Fittings Manufacturers, Suppliers and Exporters. We offer an array of Electrical Fittings comprising of Electrical Boxes, Power Distribution Boards, and Bulb Holders. All our Electrical Fittings are made at par with the industry standards and are quality tested. Additionally, in order to cater to the varied requirements of the clients, we provide our Electrical Fittings in customized specifications. For over 14 years, we have provided the clients with premium Electrical Fittings and always welcomed their feedback. Due to this, we have developed an in-depth knowledge and expertise in the domain. In addition, we believe in abiding by the core values of the company – honesty, professionalism, seamlessness and commitment. Owing to this, we have mustered a strong client base in the national and international markets. We are one of the well-recognized Electrical Metal Boxes Manufacturers, Suppliers and Exporters. Our Electrical Metal Boxes are used for connecting electrical wires together and ensure their safe functioning. Not only in varied sizes, designs and shapes, but our Electrical Metal Boxes are also available in customized specifications. We are a name to reckon with when it comes to Electrical Junction Boxes. Electrical Junction Boxes are used for connecting electrical wires together with an ease. 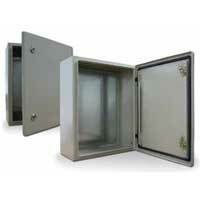 These Electrical Junction Boxes	are available in different shapes, sizes and designs. 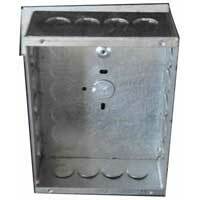 Also, Electrical Junction Boxes are made available by us in tailor made specifications and at economical rates. © Copyright 2012. Golden Crest Marketing Network Pvt. Ltd.